Yes, an armchair. A quite exceptional armchair. Such an armchair was, of course, destined for a wonderful life, and she recalled the times she lived through, the places she saw, the people who sat upon her and nearby, exactly as you might expect her to. She was clear-sighted and objective, but she also held some very firm opinions on matters that affected her. And her sister … she was one of twins. Their first home was, she felt, most befitting. They were purchased by the King as a gift for his two favourite daughters, the Princesses Adélaide and Victoire. They were loved by the sisters, and they were happy to receive many visitors from the royal household. Fortunately the two chairs left the royal household left the household in the very early days of the revolution. They were given to departing courtiers. But they were separated. Our heroine was disappointed to go down in the word, but she enjoyed meeting a who new social circle. And then there was an interlude abroad when her owner fled to England. She was unimpressed by English furnishings and by the Prince Regent. He failed to respect the furnishings, and she sustained a little damage to a foot. In time there was a return to Paris where over a long life she kept company with many of the great and good. Rothschild, Dumas,Cocteau, Diagalev …. I could go on. So many people, so many places observed by a chair that stayed the same through times of great change. Such a wealth of detail, such a memory our armchair had! Her memoirs leave me wanting to retell the stories, because this is very much a book about people met and places seen rather than the storyteller herself. There are many details that would stand retelling, but that wouldn’t be right because you really do need to meet the storyteller first hand, and hear her lifestory told in her own voice. There were many refurbishments over the years, some accepted with grace and some tolerated with impotent rage. There were indignities as she changed hands, particularly in the days when she was a little out of fashion, but there were also moments of great pride when she was admired and appreciated. Though the chair had to accept that even those who loved the times she had lived through, who tried to recreate their style, could never understand as she could. By the middle of the twentieth century the history and quality of the chair were widely recognised. After a narrow escape from death she found a stable home where she was very happy. It was a fitting end after a travelling through three centuries of French history, and the chair was a lovely companion. A reunion with her sister would make her happiness complete. Could it be? 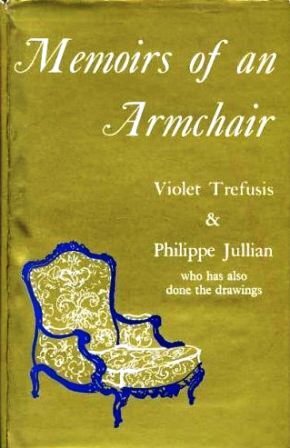 The story of the chair was first told by French author and illustrator Philippe Jullian, and in 1960 it was adapted for English readers by Violet Trefusis. She kept the original illustrations, which are quite charming, and I have the sense that she had great fun. « I didn’t mean to disappear …. I loved that!! Who would think that one is able to feel sentiment for an armchair. I thought it was bad enough I anthropomorphize my pets but now a chair!! Thanks for sharing such a lovely piece. It sounds fascinating, and an unusual way of looking at people and events through a very unusual protagonist. Is it still in print, I wonder?